navigate your music library by musical similarity, as determined by last.fm similar artists and genre tags. dbm is designed to be used with rockbox – an open source firmware alternative that runs on a wide range of MP3 players. Rockbox brings many new features to MP3 players, and the main aim of dbm is to create a system of links and playlists based on music similarity which can be used under rockbox. Please download dbm from here. Last.fm Similar For every artist, there are links to folders in the library corresponding to similar artists (links to folders containing albums by similar artists, and also links to compilations featuring a track by that artist, or by a similar artist). This provides an alternative method for choosing music to listen to: first pick an artist that's roughly the sort of music you're considering, then scroll through the similar artist offerings and either jump to one of them or to the original artist. Musicspace Similar This is the same as Last.fm Similar, except that musical similarity is defined by a personal spreadsheet file, rather than by last.fm. A-Z An alphabetical index allowing you to access a particular artist rapidly, in the same way as one can with the Rockbox database. Last.fm Similar: For every artist, a random playlist of tracks by similar artists (using last.fm similarity). As an example, here are the last.fm similar artist playlists it created for me. Musicspace Similar: The same as Last.fm Similar, but using the personal music similarity file. All Artists: Playlists of tracks taken entirely at random from the library. This is broken up into several playlists of 1000 tracks among which there are no repeats. Library This contains my actual music; this folder is not created by dbm . 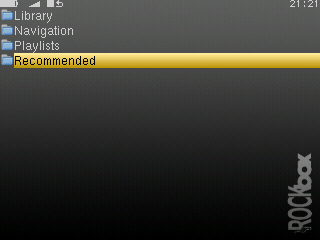 Select the folder on your rockbox device where you keep all your music. If you are still using itunes then this will be called "iPod_Control". After scanning a library, dbm will download similar artists data from last.fm for every artist in the library. This can take a while; however, if you save your library once it's done then you should not need to do it from scratch again. Note that the music library can be any folder containing music; it doesn't necessarily have to be your entire collection. The output folders for the playlists and navigation links must be empty folders. dbm will create various subfolders inside them containing the playlists and links. Once it has finished, you are free to rename and/or move these folders to wherever you want. 2009-07-04 Sat: dbm now creates a folder containing biographies (from last.fm) for all artists in the library. rockbox opens these automatically with a text viewer when you hit select. 2009-06-11 Thu: You can now make playlists and links based on last.fm tags. This looks quite promising. 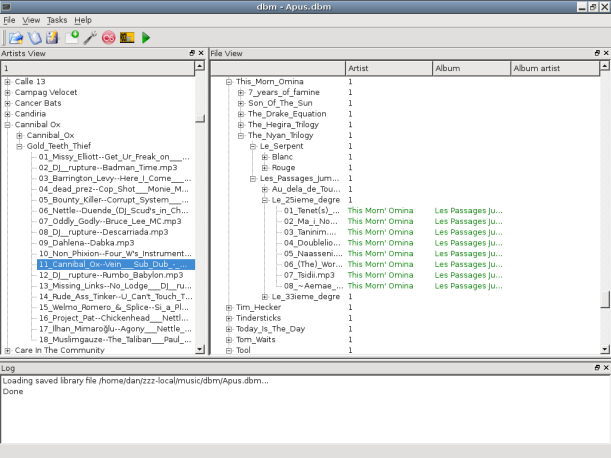 2009-04-19 Sun: The GUI now allows you to view your music library as it is arranged on disk, and by artist. Amongst other things this makes it easy to locate badly tagged music. 2009-04-05 Sun: mpc and flac formats supported, in addition to mp3, ogg, mp4, m4a. If present, dbm will use MusicBrainz identifiers to keep track of artists, albums and tracks. If not, it will just use the artist names it finds in the tags. The MusicBrainz Picard tagger can be used to add these identifiers to your music library. The original command-line interface still works. Instructions for using dbm from the command line are here. I'd appreciate it if you'd drop me an email if you're using dbm: davison at stats dot ox dot ac dot uk. I'm still working on it. If you encounter problems, please email me with a copy of the logfile dbmlog.txt and, if you don't mind sharing it, a compressed copy of the saved library file that dbm creates. I'm happy to discuss the project direction, new features etc. Humberto Santana and Sheamus Sweeney for suggestions and testing; Amr Hussan for creating the python last.fm API pylast; the rockbox developers. html generated by emacs org-mode.